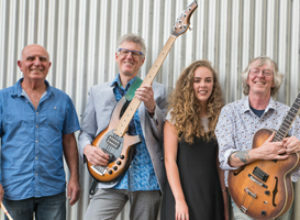 September Moon is a Kerikeri based band with a light-hearted jazz and soul repertoire. Featuring the versatile talents of Bella Mason, mixing rich and pure vocals with bluesy rawness, Julian Brady (guitar), Phil Gore (drums) and Alan Thomas (bass), the band can entertain from lunch through to late and will even hang around for breakfast. PLACE The Turner Centre bar prior to Kiss the Sky – NZ Dance Company.